November | 2015 | Wow, love that recipe! Can you ever have too many baking tins? I used to ask this question about shoes, now it’s baking tins! If you check out the Nordicware website, I’m sure you won’t blame me for my new addiction! I mean, just look how great these cakes turned out. They just wouldn’t have been the same if I had used a traditional bundt tin. Anyhow, this recipe is adapted from the cardamom and pear loaf recipe in the Waitrose magazine, November 2015. Of course, cooking it in the loaf tin would have been good too. A friend of mine also made this recipe with cinnamon instead of cardamom and that also worked really well. Preheat oven to 180°C/160°C fan/ gas Mark 4. Grease a baking tin (I used a mini heritage bundt tin by Nordicware, (nordicware.com) which produced six mini cakes, but you can use any type of tin, just adjust the baking times). Crush the cardamom seeds in a pestle and mortar. Melt 25g butter in a frying pan over a medium heat with 25g of the sugar until bubbling. Add the pears and cook for 5 minutes, turning often until slightly soft. Remove the pears, leaving the butter in the pan and set aside. zest and the remaining butter and sugar. Beat until smooth and creamy, then work in the eggs, a little at a time. Mix the flour and baking powder, then fold into the mixture until well combined. Put the pears into the mixture. Sprinkle the flaked almonds into the bottom of the tin. Spoon the mixture into the baking tin. Bake for 25 minutes or until a skewer comes out clean. Leave in the tin to cool and then turn out the cakes onto a cooling rack. Sprinkle with a few more flaked almonds and dust with icing sugar. I don’t think I’ve shared on this blog how amazing Pierre Hermé is. He’s a French pâtissière whose macaron flavours will blow your mind. He has a shop in Covent Garden which is one of my ‘happy places’. Every month, he has a new macaron flavour, so there is always a reason to go there. One of his favours from his permanent collect is Ispahan. This is a combination of rose, raspberry and lychee. The last time I was in his store I saw that he also did Ispahan jam and granola. Now, my mum loves granola and makes the most fantastic granola herself, so when she came to visit, I wanted her to have something special for breakfast. The recipe comes from Red Magazine (November, 2014) and is one that PH wrote exclusively for them. Cut the almonds into thin strips. Spread evenly on a baking tray lined with greaseproof paper with the pistachios and pecans which you can also slice, if you like. Bake for 15 minutes. Remove from the oven and allow to cool. Heat the honey in a saucepan until it becomes very runny, add the oats, sunflower and pumpkin seeds and coconut. Spread evenly in a baking tray with greaseproof paper. (At this point, I would add the 2 teaspoons of rose water, though this is not in the original recipe). Bake for 20 minutes, turning around every 5 minutes to ensure even baking. Remove from the oven and leave to cool. Add the nuts, raspberries, rice crispies (if using) and at this point, the original recipe adds the 2 drop of rose water. This will keep in an air tight container for 3 weeks. This is fast becoming one of my all-time favourite salads. What first attracted me to this recipe was the colour of the pears; I think they look amazing. So this was the salad I made when my mum and dad came for a fleeting visit, and they loved it. The ingredients are simple, flavoursome and marry together so well. The recipe is from Rachel Khoo’s, My Kitchen Notebook. In the original, she uses blue cheese which I like, but not everyone is a fan. My parents really enjoy goat’s cheese which works extremely well, so I used it in this version of the salad. I’ve also made it with feta which is also delicious. You don’t need to use a salad dressing as the pears are quite juicy and sharp. If you really wanted, you could drizzle a little of the pickling liquid over, but I don’t think it needs it. A nice addition to this is a handful of pan roasted walnuts or pecans sprinkled over the top. Put the water, vinegar and sugar in a medium saucepan and bring to a gentle simmer over a low heat. Stir to dissolve the sugar, then add the pears and beetroot. Cut a piece of baking paper/parchment larger than the diameter of the pan, crumple it up, and cut a hole or slit in the centre. Place in contact with the liquid and let some seep through to keep the paper in place. Cover and simmer gently over low heat for 1 hour. Remove from the heat and transfer the pears, beetroot, and all the liquid to a lidded container. Set aside until it cools to room temperature, then put in the refrigerator to pickle overnight. When ready to serve, cook the lentils following the package instructions, then drain. Transfer the pears to a cutting board and the beetroot to a bowl (discard the liquid or save it for up to 1 week for pickling something else). 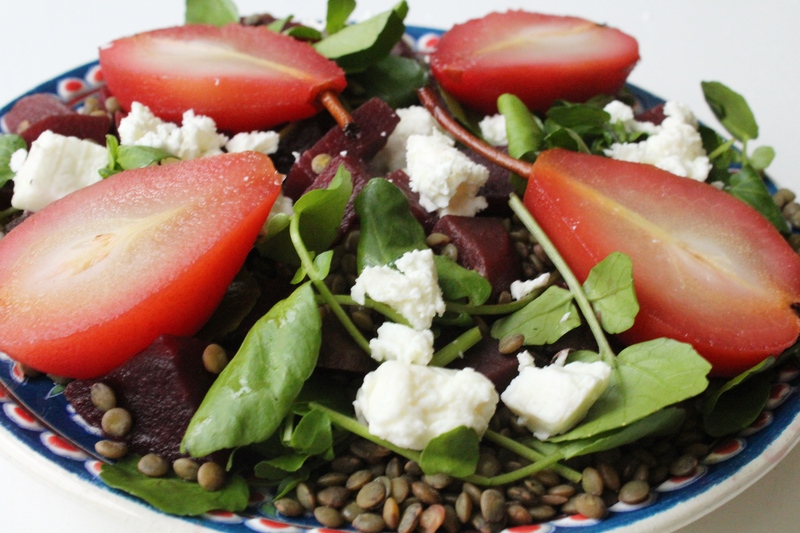 Toss the lentils with the beetroot, then crumble the cheese into small chunks and add to the bowl. Divide the mixture among four salad plates. Cut each pear in half and place them on the serving plate, with a little watercress. Drizzle with the oil and sprinkle with salt and pepper. I can’t believe how well these muffins turned out. 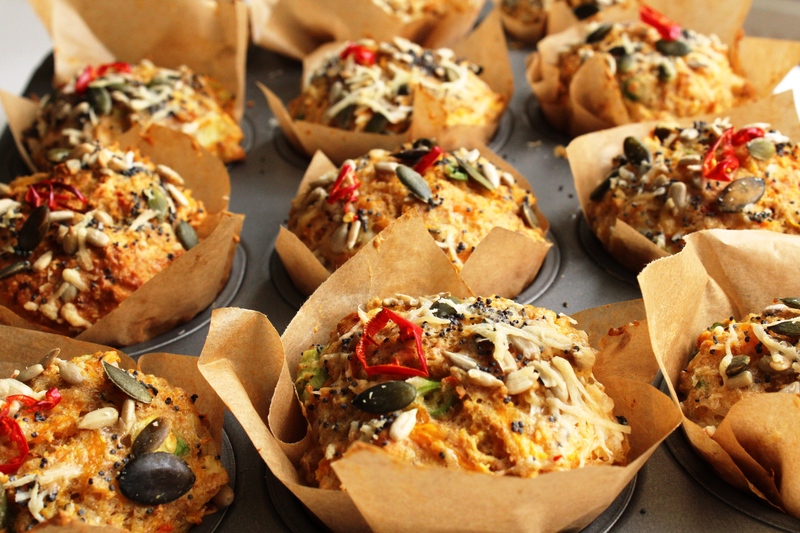 To be honest, I’m not really a fan of muffins, either sweet or savoury. I made them for C, but when they came out of the oven, they smelt so good. I just had to try one. 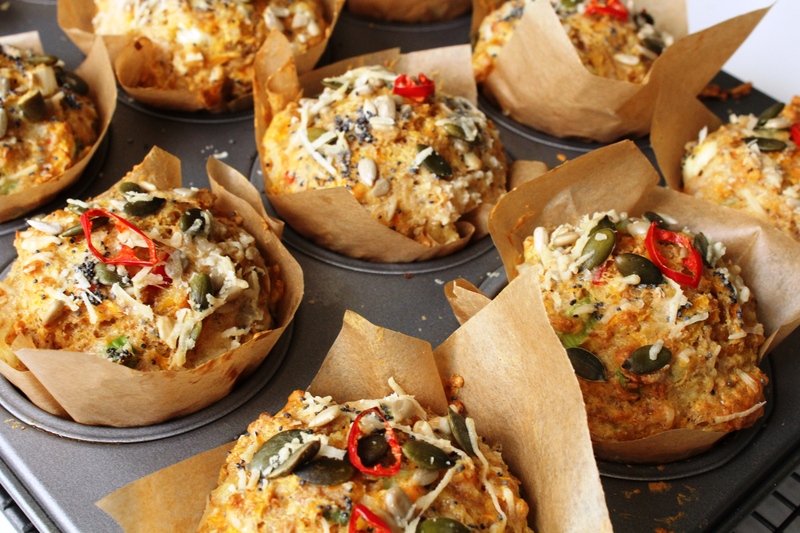 And well, I have been converted; this recipe has changed my whole attitude to muffins! These ones are cheesy, spicy and extremely comforting. 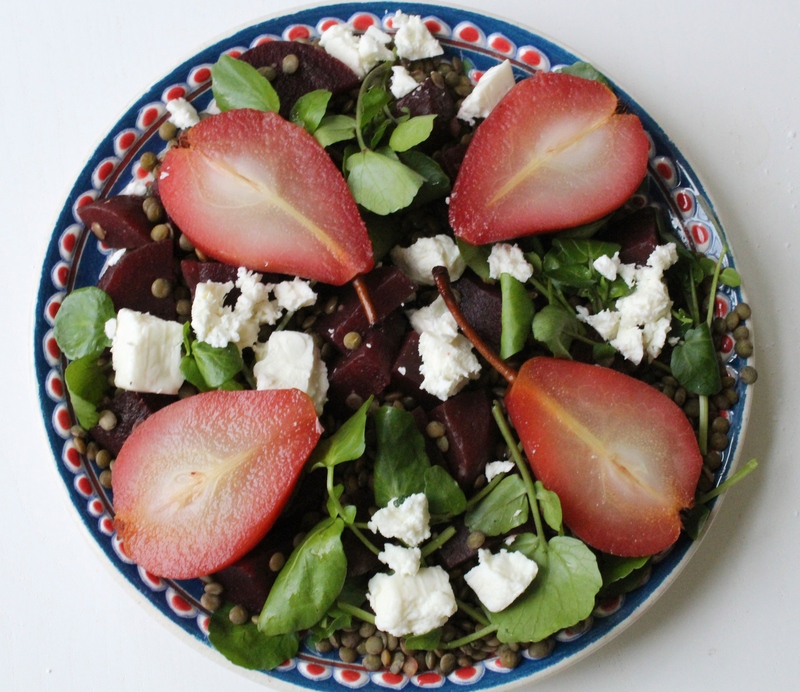 This is a stunning recipe from Jamie Oliver’s new Superfoods book. I’ve been really impressed by the Superfood series on TV, not just by the ‘superfood’ concept but by the number of recipes I actually want to make. I’ve also made the tofu burgers which may sound boring, but were fantastic. Kudos to Jamie Oliver. 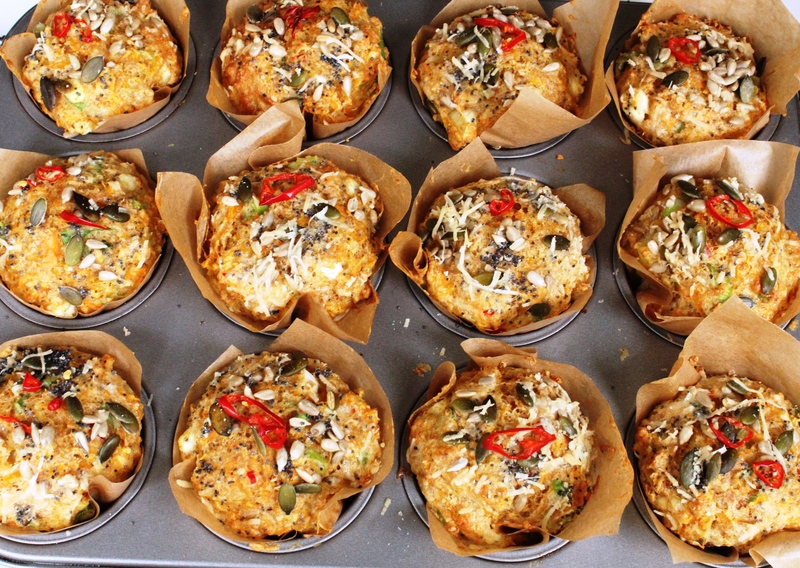 Line a 12-hole muffin tin with paper cases or 15cm folded squares of greaseproof paper, then lightly wipe each one with oiled kitchen paper. Peel the sweet potatoes or squash and coarsely grate into a large bowl. Trim the spring onions, then finely slice with the chilli and add to the bowl, reserving half the chilli to one side. Crack in the eggs, add the cottage cheese and flour, then finely grate in most of the Parmesan and season with sea salt and black pepper. Mix until nicely combined. Evenly divide the muffin mixture between the cases. Sprinkle over the sunflower and poppy seeds, then dot over the reserved slices of chilli. Use the remaining Parmesan to give a light dusting of cheese over each one. Bake at the bottom of the oven for 45 to 50 minutes (if using squash, it’ll be a bit quicker – check after 35 minutes), or until golden and set. These are amazing served warm 5 minutes after taking them out of the oven, and good kept in the fridge for a couple of days.